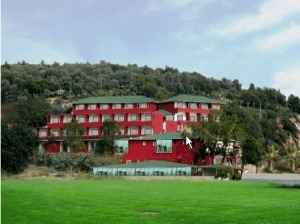 Nestled between the Taurus Mountains and the Mediterranean Sea, White Inn Hotel is 5 km from the center of Alanya. It has a private beach area and offers air-conditioned guestrooms with balconies. White Inn rooms have parquet floors and simple furnishings. They come equipped with satellite TV and a minibar. The private bathrooms include a hairdryer. In the morning the Inn serves a buffet breakfast with fresh fruit and hot tea. The hotel’s restaurant offers buffet meals with traditional Turkish dishes prepared from fresh ingredients. Guests can relax in a sun lounger by the seasonal outdoor pool, or visit the fitness center. The hotel has a Turkish bath and provides free Wi-Fi in public areas.